A little more than fifteen years ago, I joined a small group in Carmel that was raising money to save Robinson Jeffers’ Tor House. The poet’s son Donnan had died some years earlier, leaving a widow and a mortgage. The family wanted to preserve the famed stone house, tower, and gardens, but they lacked the financial means. Although a foundation had been created in 1978, it was a small volunteer group of limited resources. Some local literati organized a campaign and a few out-of-town authors, including myself, were asked to help.The challenge seemed quite simple. The home of a great American writer needed to be safeguarded for posterity by raising a significant but not enormous amount of money. Tor House, with its accompanying Hawk Tower, was a unique and strikingly beautiful home that had been built mostly by the writer himself on a spectacular point overlooking the Pacific Ocean. Carmel was one of the richest towns in the United States, and it proudly celebrated itself as an arts community. What could be easier than to rally sophisticated Carmelites to save one of their leading landmarks?At the first benefit, I realized that my task was not primarily to ask for money or extol the cultural benefits of saving Tor House. My real job was to explain to wealthy and well-educated Carmel residents, many of whom had lived in the small seaside “village” for decades, who Robinson Jeffers was. Mine was hardly an unsympathetic assignment. I considered Jeffers a major American writer and the finest poet ever to emerge on the West Coast. Yet I was slightly surprised at the nearly universal ignorance about Jeffers, though I might have expected it. Californians are notoriously indifferent to—and therefore ignorant of—their own remarkable history, even when it occurred down the street and involved a man who had been featured on the cover of Time and commemorated on a U.S. postage stamp.Eventually, we succeeded in raising the necessary funds, and Tor House survives as an exemplary public trust. The experience, however, started me thinking about the growing challenges we face in trying to preserve the past in today’s frenetic, novelty-obsessed, electronic culture. The dilemma of saving our history and the best of its physical legacy is a national issue, but probably nowhere is it more pressing than in California, a state that always has preferred to live in the future tense and which from Hollywood to Silicon Valley has been the center of the new ethos of disposable culture and rapid obsolescence. Some years later, I found myself in Washington, D.C., leading the National Endowment for the Arts, which is located in the Old Post Office, a magnificent Romanesque Revival edifice—second in height only to the Washington Monument— whose iconic stone clock-tower overlooks Pennsylvania Avenue. Perhaps because in 1973 the building had been slated “for removal” (a demolition permit actually had been issued), I was reminded daily of the vulnerability of America’s cultural heritage and recalled my fundraising experiences in Carmel. I not only thought about how few literary sites had been preserved in the United States, but also how oblivious most Americans were of the local sites that had been conserved and maintained, usually at great expense and effort, in their own communities. My staff and I made an inventory of the homes of American poets that had survived and were open to the public. It was a depressingly short list. Most important, once the program got underway, literary reading in the United States increased for the first time in three decades.At this time, the Arts Endowment was busy launching the Big Read, a campaign designed to promote literary reading. (The agency had created international concern about the widespread decline of reading in the United States with our influential 2004 study Reading at Risk. Now we were trying to address the problem.) Although managed on a national basis by the NEA in partnership with other federal and regional organizations, the Big Read worked as a local program that offered citizens the opportunity to read and discuss a single book of literary distinction within their own communities. The Arts Endowment provided initial funding, organizational guidance, and superbly produced materials (reader’s guides, teacher’s guides, radio shows, CDs, films, and websites). The local communities raised matching funds and built local partnerships to support the program with a variety of activities suited to their specific population. After being tested in ten cities, the Big Read expanded nationally in late 2006, eventually reaching nearly 500 cities across the nation and enlisting over 25,000 local organizations as partners. The program proved a huge success with all of its constituencies, from town librarians and high school teachers to members of Congress. Most important, once the program got underway, literary reading in the United States increased for the first time in three decades. Wherever possible, the Big Read involved literary sites as partners—such as Jack London’s ranch in Glen Ellen, California, or Edith Wharton’s The Mount in Lennox, Massachusetts. In each case, the Big Read boosted the attendance and prominence of the site. All of the Big Read selections, however, were novels—eventually twentyfive diverse titles ranging from Ray Bradbury’s Fahrenheit 451 and Zora Neale Hurston’s Their Eyes Were Watching God to Willa Cather’s My Antonia and Marilynne Robinson’s Housekeeping. Poetry seemed too daunting for consideration as a selection that required broad appeal among the various members of hundreds of communities across the United States. (Each community chose its own title from the extensive list of selections.) But the example of Tor House stayed in my mind. Could we create a smaller version of our very big program that might simultaneously serve both poetry and historical preservation by celebrating great American poets in their own communities? Starting with two poets whose homes had been preserved—Henry Wadsworth Longfellow and Robinson Jeffers—we created our Big Read American Literary Landmarks program, a deliberately local version of the national program.Starting with two poets whose homes had been preserved—Henry Wadsworth Longfellow and Robinson Jeffers—we created our Big Read American Literary Landmarks program, a deliberately local version of the national program. I approached John Barr, the president of the Poetry Foundation, about a partnership, and he joined forces with us. We then quickly launched the program in order to be ready for Longfellow’s bicentennial celebration in 2007. Longfellow offered the added advantage of having three wellmanaged sites—his Cambridge, Massachusetts, home; his childhood house in Portland, Maine; and the Old Wayside Inn in Sudbury, Massachusetts, the location of his famous collection of poems. With Jeffers we were able to create a program across the entire Monterey region involving not only Tor House but also the National Steinbeck Center in Salinas. The Big Read became the largest program ever undertaken by the Tor House Foundation, and it gave the organization valuable experience in cultivating larger audiences—as well as creating local partnerships that could be continued later for other projects. Soon Occidental College, Jeffers’ alma mater, followed with a Big Read program to build awareness and appreciation of its most famous literary graduate and his advocacy of environmental concerns. The initial Literary Landmarks programs proved so successful that we soon added two more poets to the Big Read list: Edgar Allan Poe and Emily Dickinson. As we developed the material for the Robinson Jeffers Big Read program, I was struck by a similarity: what we were doing on a large scale was exactly what I had done at the first Tor House benefit dinners years earlier: explaining to Californians that there had been a great poet in their midst who had left them an invaluable literary legacy as well as the romantically beautiful home in which those works were written. Whether you’re a writer or politician, if you want to change the world, you need to tell a story that enlists the listener’s support. I like to think that, in some small way, by telling Jeffers’ story we helped California prize its rich history. First published in California History, Volume 87 number 2, 2010. 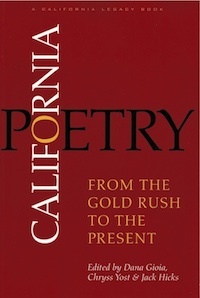 Robinson Jeffers is included in California Poetry: From the Gold Rush to the Present.